Reminder: The 626 Golden Streets event is on tab for this Sunday and it sounds great. How often can you ride your bike sans traffic for 17 miles from South Pas to Azusa? (Answer: You can’t). The weather forecast is calling for sunny skies and a high of 69. Perfect! More about the event here. We’ll be running three-car trains on the Gold Line to help support folks get there with their bikes. Weekday ridership in Gotham was the highest since 1948 but weekend boardings fell three percent in 2016. Officials say that service delays, maintenance closures and a huge increase in Uber rides over the past year are likely culprits. This mirrors what is happening elsewhere, including our region where Metro ridership dipped almost six percent in 2016 compared to 2015 with the losses on the bus side. Across the United States, transit ridership was down 1.59 percent through the first three quarters of 2016, according to the American Public Transportation Assn. More on Uber and ride hailing below. On a related note, Streetsblog has a post saying that transit ridership is down in many places but not Houston and Seattle, where bus networks have been redesigned. But the APTA numbers show very, very modest increases in both areas. I think it’s worth noting that ridership news is landing at the same time that federal budgets are being proposed. Even in high ridership times, transit dollars are never easy to come by — and right now driving and car sales are at all-time highs. So stay tuned on that front — it’s almost impossible to say what will happen, especially with the Trump Administration also saying there’s an infrastructure plan in the works. There is, of course, a lot of speculation about what will be in any kind of new infrastructure plan. As for Gov. Brown’s proposal, the 710 South project has $1.308 billion in funding (mostly from Measure R and Measure M) and Metro has been working on the environmental study phase for several years — here’s the project home page. Point of emphasis: this project involves the 710 between the ports and the 60 freeway. An entirely different project is looking at ways to improve traffic and/or transit in the area around the 710 gap between Alhambra and Pasadena. As for the transit side of things, Metro has already scored a trio of big federal grants for projects under construction: $1.25 billion for the first phase of the Purple Line Extension, $1.187 billion for the second phase of that project and $670 million for the Regional Connector. 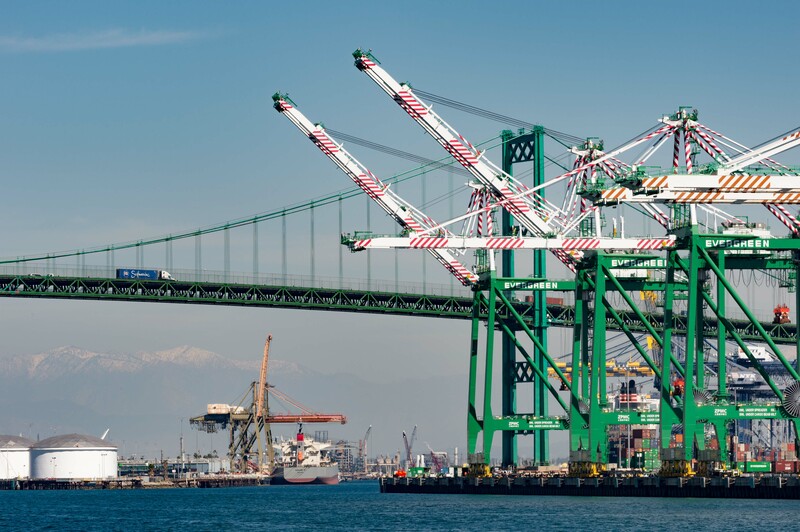 The 710 South project is seen as a way to help improve traffic between the ports (the Port of L.A. above) and the trucking and railroad distribution centers near the junction of the 710 and 60. Photo by Steve Hymon/Metro. The cumulative auto debt in the country reached an all-time high in December at $1.16 trillion, Bloomberg reports. And they toss in this fun fact: that’s an average of $6,100 debt for every licensed driver in America! Reason to light your hair on fire and go for a Panic Jog? Probably not as consumers tend to have a good record of paying off car debt and cars are more liquid than, say, homes (see: 2008). That said, auto loans have increased to those with lesser credit scores and Bloomberg notes that could lead to problems down the road, pun intended. And why is everyone getting new cars? Well, Bloomberg notes, there’s a lot of good financing deals out there. It doesn’t hurt, too, that gas has been cheap the past couple of years and many new cars are loaded with some pretty nifty gadgets, including safety features. If you have a new car, enjoy it and remember — using transit is one way to extend the life of your big investment. That’s my plan; I got zero percent, btw, when replacing my beater Subaru. The 10.5 mile light rail extension is a suburb-to-suburb line with service to Aurora, a city of about 360,000 — not exactly a tiny ‘burb. The R Line mostly runs along the 225 freeway and on either end connects with other raillines — one heading into downtown Denver and the other to Denver International Airport. The ‘burb-to-‘burb aspect is somewhat unique for light rail and it will be intriguing to see how the line fares in a car-friendly patch of Denver. Of course, some of Metro’s light rail lines are now ‘burb-to-‘burb, too — everyday I see people riding between Pasadena and the Arcadia, Monrovia, Duarte, Irwindale and Azusa stations and Expo is seeing people travel between Santa Monica and the likes of Palms and Culver City. It has been a rough couple of months PR-wise for the ride hailing giant. Jalopnik does a deep dive and finds many reasons to question the company’s future, namely whether it can ever turn a profit while offering cheap rides. Expanding into new countries and the self-driving car realm is also chipping away at the bottom line, plus the company seems to have a special affinity for inflicting wounds upon itself. All that said, ride hailing certainly seems to remain extremely popular. I have no doubt Uber & Co. have put a dent in transit ridership because it’s often so ridiculously cheap and easy to grab an Uber. But I suspect it’s inevitable that fares will rise over time, perhaps significantly. If something is too good to be true, well, it’s probably too good to be true. Will that push people back to transit? Probably some of the time, although I think people are not timid about spending money on mobility (see: item above) and will continue to use ride hailing for its door-to-door convenience. With ridership off at many transit agencies, I think the message is pretty clear: if you want the discretionary crowd to ride (and keep riding), speed and convenience matters. A lot. Denver specifically is barred from independently annexing any land by the Colorado State Constitution. There was a point in the mid-1980s where Aurora was on track to becoming the largest city (by population) in Colorado. What the R line does is allow trips from DIA to much of the region without having to traverse Downtown Denver. And for much of Southeast Denver, the route to DIA via the R line is going to be easier and potentially quicker. Hey Erik — that’s good background and good to know. Look at some of the travel times to the airport via the R and A lines on google maps. Kinda longish. Looks like some minutes vanish into the ether with the transfer from R to A. My experience riding here is that RTD LRT takes about twice as long or about half as fast. There are some very slow street-running sections. However, downtown Denver parking costs approach or exceed those of downtown LA which keeps ridership up. $1.16 billion in auto debt? Don’t you mean $1.16 trillion?